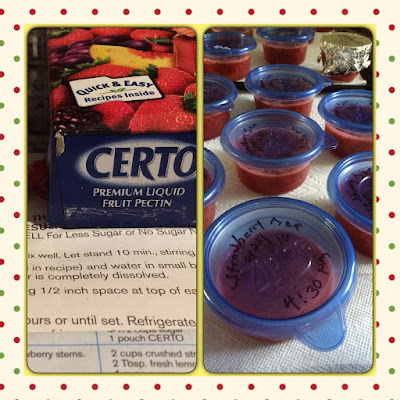 Strawberry Freezer Jam is a great treat to find in the freezer during the year! Making jams in the summer was a tradition I grew up with & have kept. My sister & I would help our mom make jams & jellies during the heat of the summer. That was when air conditioning was not a comfort option. We were a one car family with my dad driving the car to work every day. These days central air is so comfy on a hot summer day & 2 cars work great! June is always the month when I purchase the quarts of locally grown strawberries from Meadowbrook Farm in East Longmeadow. They are cleaned & prepped for our freezer. Three quarts are saved to make three batches of Strawberry Freezer Jam. In the spring I purchase the 1 cup plastic freezer containers, Certo liquid pectin & needed amounts of sugar (when bags of sugar are on sale). Lemon Juice is always in my fridge. When Strawberry season arrives here in the Pioneer Valley, it's time to get busy! Three batches are prepared, but each batch is prepared separately. 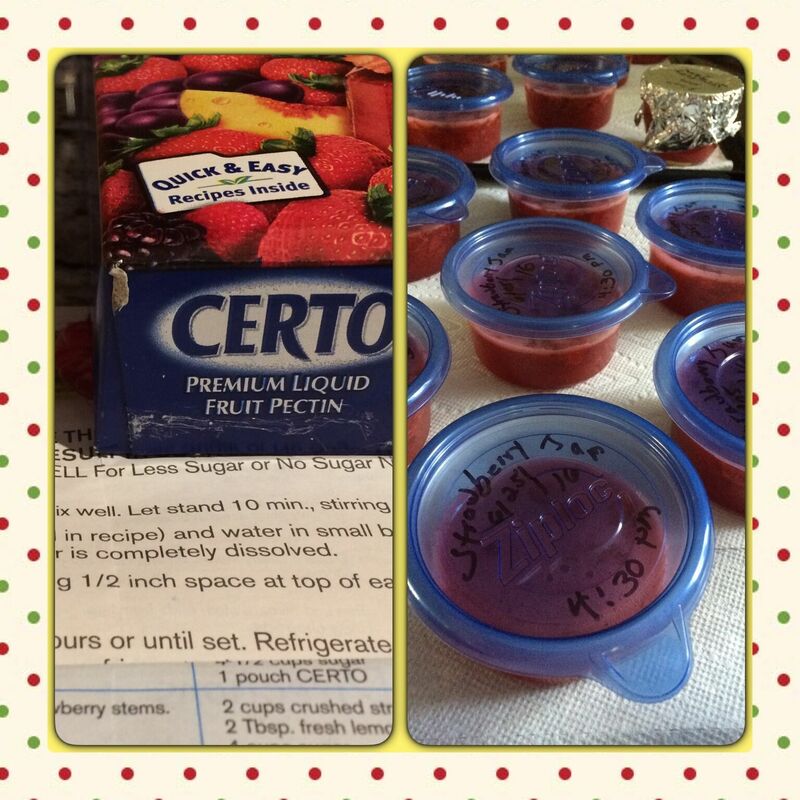 The directions are found in each box of Certo for freezer & cooked jams & jellies. It's always a good idea to read the directions before starting. One thing to keep in mind is to: Follow Directions Exactly. Click here for my hints for making yummy Freezer Jams. Scrolling through my Twitter feed a couple of weeks ago I spied an interesting recipe from Kraft Foods. The foodie photo looked so good! Scanning the ingredients I discovered we like each one! It looked easy to prepare. Even the name had the word easy in it! Easy is good! It didn't take long to decide this entree would be in our oven later in the week. 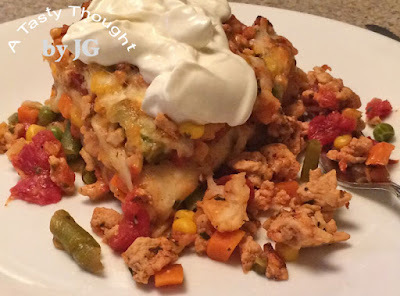 It was a Baked Taco Pie! Tortillas & the filling mixture are layered before baking. The best casserole baking dish I have to use here was my smaller square rose colored Pyrex baking dish. That worked great! These days I'm substituting Ground Turkey for Ground Beef whenever possible in recipes. Ohhh, cholesterol has a background with my family. Genes play a role & choices also play a role! 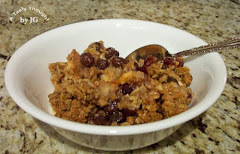 So, I've changed the original recipe a bit & we totally liked it! Yes, servings remained after dinner & they seasoned very well for 2 days when we enjoyed this entree again for dinner. Tortillas are layered here, so it is filling. Try it, you'll like it! Brown Ground Turkey in skillet, drain any fat. Add Chopped Onions, Chili Powder, Dried Basil & Oregano to skillet, stir. Add drained Diced Tomatoes & Corn Mixed Veggies, stir. Spray casserole baking dish with PAM. Place 1 Tortilla on bottom. Place 1/3 of filling mixture on top, spreading evenly. Then, place 2 Tortillas on filling mixture. Layer another 1/3 mixture on, topping with 1/2 Cup Shredded Cheese. Place 2 Tortillas on top, then filling & sprinkle on Shredded Cheese. Bake 25- 30 Minutes in 375°F oven. Cut & serve with Low Fat Sour Cream. Tomorrow we will be enjoying a Chicken dish in my Slow Cooker! Soon, we'll hear that schools across the country have finished their school year! The carefree days of summer will be here. It's the time when parents like to find an activity that will keep everyone happy! :) If you live in, will visit or will travel through my home state of Massachusetts, the Highland Street Foundation has an answer. Every Friday this summer starting on June 24 through August 26, there will be 8 specific places to visit- with Free General Admission! 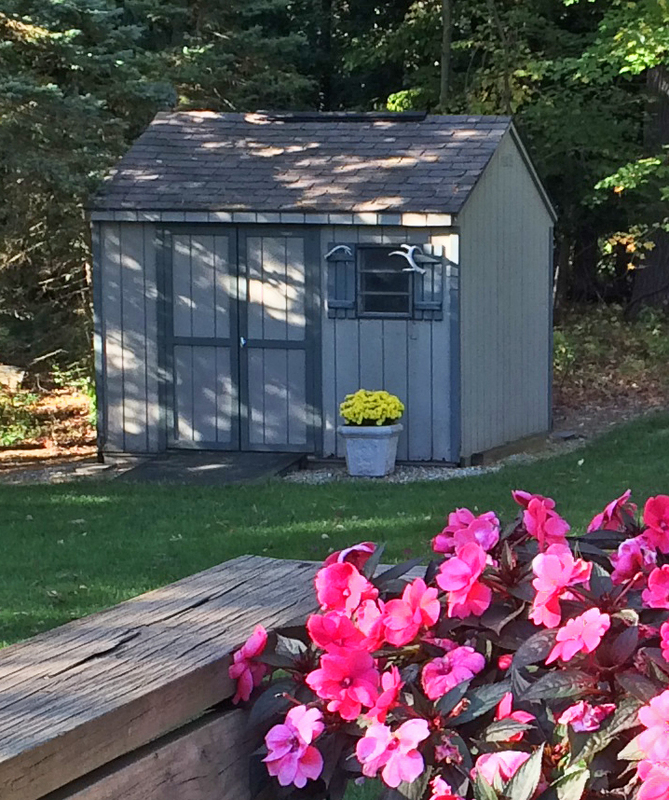 These interesting places are located throughout Massachusetts. From the Berkshires to Boston & The Cape (Cape Cod) and from northern MA to the southern border there are cool interesting venues that teach while having FuN! During the summer months "Learning" does not come to a halt! Take this opportunity with your children & grandchildren to learn another tidbit about Science, History or about an Artist! This program is not limited to a certain age group, either. It's open to everyone. Jim & I enjoy this program! If you have a chance to take a Friday vacation day, look at the list of places to visit & visit with a friend(s). 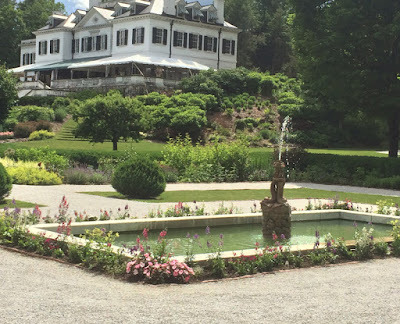 Edith Wharton's home, The Mount, is in Lenox, MA. This estate in the Berkshires is listed as one of next Friday's choices. It's the opening day for this program. Take the opportunity to walk in this great American author's gorgeous tranquil gardens after touring inside her beautiful home. Go back in time with your family this summer to the 17th century! 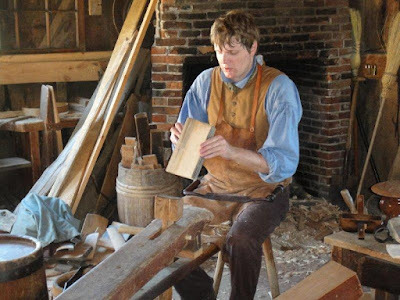 Visit Plimoth Plantation in Plymouth, MA. Walk through the re-created 17th Century English Village and learn from the costumed Interpreters. 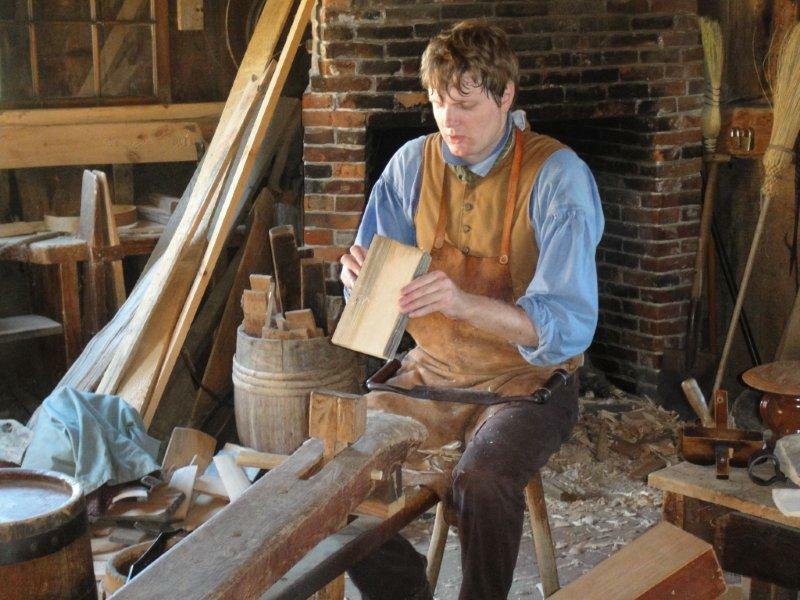 Learn about the grist mill for grinding corn that the Pilgrims in Plymouth Colony built. They speak in the dialect of that day. The Springfield Museums in Springfield, MA is 4 museums in 1 complex. Art, Science, History Museums & the Dr. Seuss bronze sculptures. 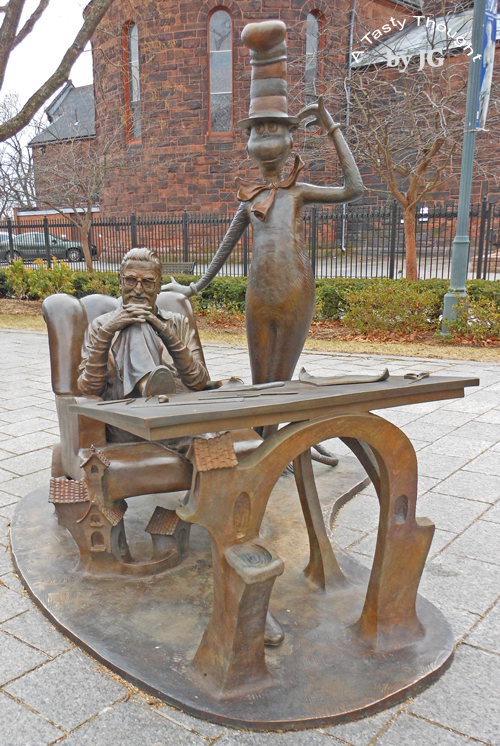 Theodor Seuss Geisel was born in Springfield. Chinese Cloisonne, Monet, Field, Indian Motocycles (Motorcycles), Early Automobiles & more await here. Dr. Seuss & his friend! 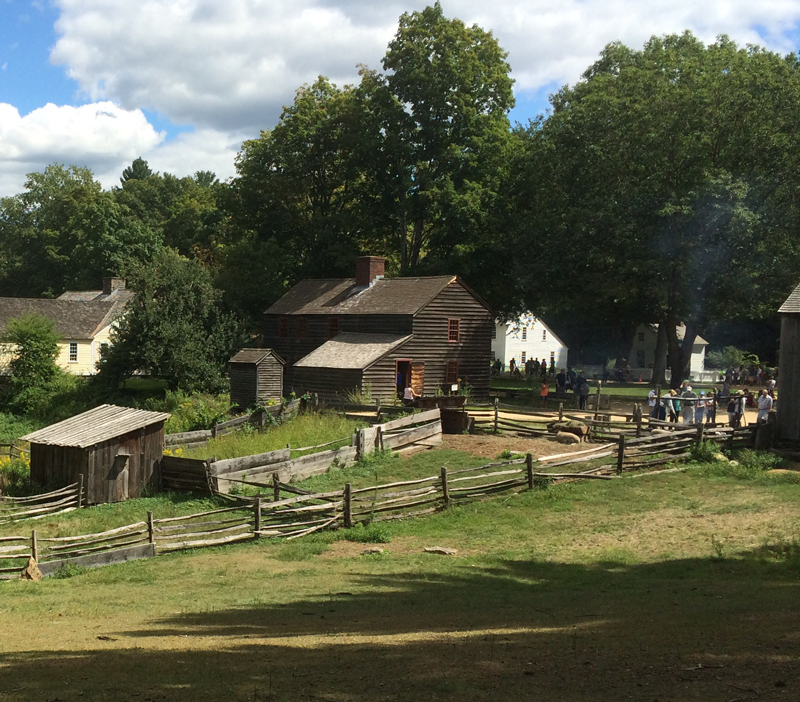 It's always great to stop in to Old Sturbridge Village, a recreated 1830's living history museum located in Sturbridge, MA. A walk down the road to the village leads to the Center Meetinghouse. A Printer's Office, the Mercantile, the Bank & housewives doing seasonal chores in their homes teaches us about life in another time period in our country. The Freeman Farm is not far away. A fave of my grandsons is the Franklin Park Zoo located in Boston, MA. They are always up for a visit there! These are only a few of the great places to visit! 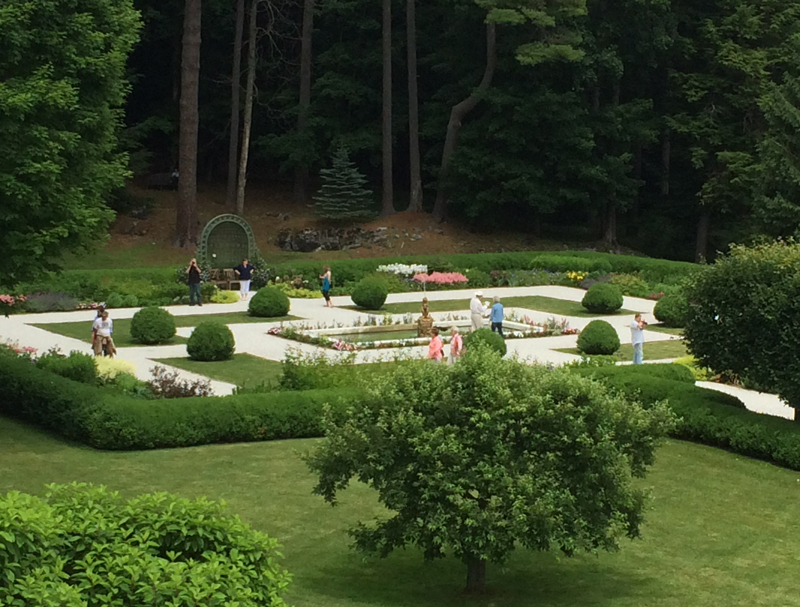 There are so many interesting family friendly sites to visit on Fridays this summer with no regular admission charge! Check out the list clicking here to discover what Friday you have available & what specific places you can visit for free. Thank you Highland Street Foundation for sponsoring this program again this year! Chicken Florentine in my Slow Cooker always tastes oh so good! The colorful dinner with tender chicken pieces & chunks of vegetables. Then, there's the great sauce! Every forkful begs another! It's the yummy dinner where the Baby Carrots & potato chunks are placed in my non-stick Slow Cooker's pot first & then the Chicken Tenders, topped with defrosted frozen spinach. A quick visit to my Spice Rack for the dried ingredients & it does not take long to prepare this meal. It's one of those quick & easy dinners that really cooks itself- first on High heat, then on Medium heat. Yes, there's more to the story, but you get the idea. With my non-stick pot that's sprayed with PAM, I've learned to place a hard veggie on the bottom. Learning the hard way that meat can become too crispy & tasteless if placed on the bottom of the pot, first. Today, a large Yam was substituted for a white Potato that I usually use. A couple of days ago we enjoyed Baked Potatoes at dinner, so white Potatoes were not going to be repeated. Oh, what a great difference a Yam makes! 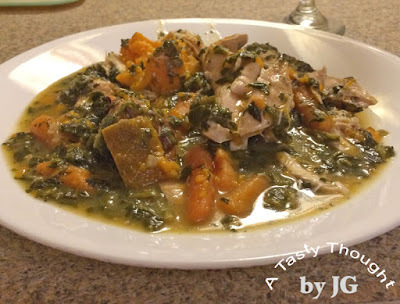 While enjoying this one pot meal, every bite contained a sweetness from the Yam! Now, I'll always use this veggie when making this Slow Cooker/ Crock Pot dinner. Rinse Baby Carrots under cool water. Place in Slow Cooker's pot. Rinse Yam (using veggie brush) under cool water. Cut into 1" chunks, quarter & place in pot. Add 1 teaspoon dried Parsley & 1 teaspoon dried Chopped Onions. Rinse Chicken Tenders under cool water. Place on top of vegetables. Sprinkle on about 1/4 teaspoon Oregano, 1/4 teaspoon Basil & 1/8 teaspoon Garlic Powder. Add defrosted Spinach on top, spreading evenly. In a bowl mix 1/3 Cup Water with 1 Can Healthy Request Cream of Mushroom Soup. Spread evenly over top. Place lid on Slow Cooker & set temperature. Cook on #5 High- 1 Hour. Then, reduce to #3 for 2 Hours. This is so good any season of the year! Now, whenever I have plans to make this Slow Cooker meal, I'll always include the Yam! The annuals were planted last weekend. Marigold seeds found their new homes in pots. They have a history with me. A beautiful potted Marigold on Mother's Day was gift from my little grandsons 2 years ago. 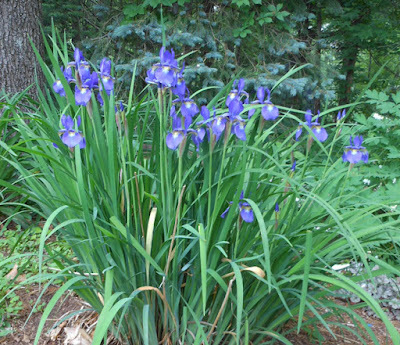 That sturdy plant provided seeds to save the first year. 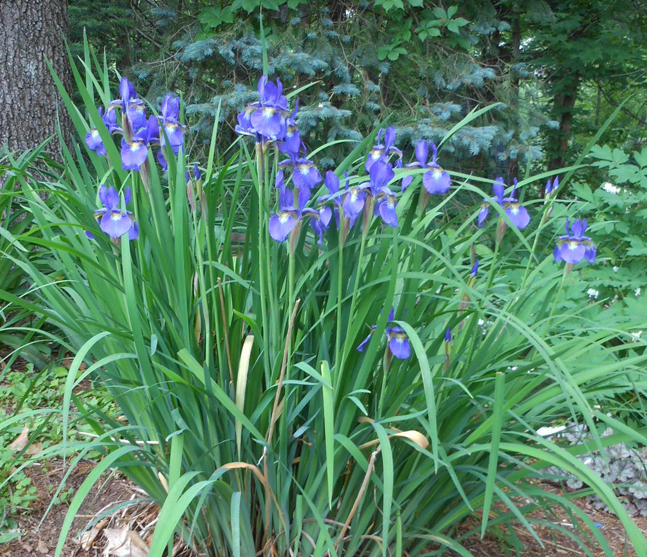 They were planted last year & blossomed. Seeds saved again. It didn't take long for them & the Zinnia seeds to sprout! Today, just enjoying the perennial gardens while doing chores.